I purchased this, 2 matching dressers and a nightstand. It wasn't cheap, but they are all well constructed pieces of furniture. The wire brushed look and texture is very nice. No cheap veneers or manufactured wood. It looks and feels like it will last a long time! Overstock used a local shipping company for delivery (NOT UPS, Fedex, etc). The delivery guys were very nice, but keep in mind they are only paid to cross one threshold. The bed was well packaged and arrived pretty fast. 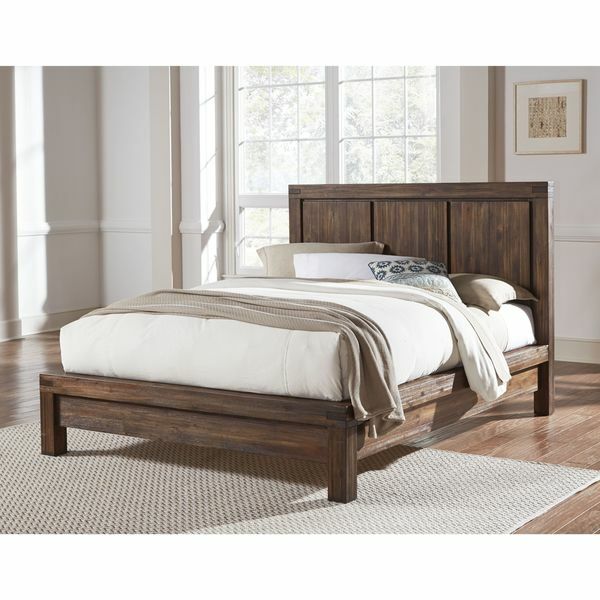 Bring the beauty of the outdoors inside with this lovely wood platform bed. The wire-brushed finish brings out the natural beauty of the acacia wood and adds to the distressed appearance of the bed, perfect for shabby chic, beach themed, rustic or traditional homes. Clean, straight lines and large headboard panels create a look that's simple to dress up or dress down. Add a homemade quilt for a relaxed feel, or use a plush comforter to create a striking contrast. There's no need for a cumbersome box spring with this platform style bed, so you can keep your bedroom uncluttered and streamlined. Let me start off by saying that I really love this bed. I ordered it in a king size and I couldn't be happier with it. It arrived in a very timely fashion, but unfortunately one of the legs to the headboard was pretty beat up. Let me be clear though, this was due to being mishandled by the freight company, not Overstock. I called Overstock customer service and they were extremely helpful in getting the situation resolved. While they would have gladly replace the item, they also gave me the option of keep the damaged item for a discounted price. Because repackaging the headboard and waiting for a new one to arrive was going to be a hassle (for me and probably for overstock too), I chose to keep the bed and take the discount. Everything else about this bed is wonderful. It looks great and was incredibly easy to put together. Once we set it up and put the night stands next to it, we can't even see the damage to the leg! I definitely recommend this bed! This bed was just what we were looking for in a platform bed. It went together easily. No issues. It did not have any damage when it arrived. We love the deep tones of the wood. So far it has been very sturdy. Our bedroom is Rustic/Tuscan and it works well with the decor. Nice Heavy Solid Wood Bedframe! Heavy, quality wood and design. We received our bed about a month ago. It was packaged very well. It is a heavy piece of furniture as it is made of solid wood. The bed was very easy to put together - all hardware was included and the instructions were refreshingly clear. You will definitely want a power screwdriver for this, though. It is a beautiful bed and seems very sturdy. The wood on the headboard panels are rough - you could conceivably get small splinters if you rubbed it a lot - but I think that is just the rustic style. We are very happy with the quality and the value of this bed. No chemical smell which was a plus! Headboard arrived in box that had clearly been used before. Headboard had multiple scratches and dents. Solid Wood, easy to assemble. Although this arrived damage in several areas (Overstock customer service was very quick to remedy this!) it is a gorgeous bed. It was very easy to put together and looks great in my guest room. easy to install. did not have any problem. "Can you tell me how high the base is off of the ground and what the clearance under the bed is? Thanks! " "Can you please send me the link for the matching nightstands (shown in the photo)? Thanks!" "hello - what are the dimensions of the queen?" The queen measures approximately 51 inches high x 61 inches wide x 82 inches deep. "The description for the bed does not appear to be the correct one. It describes a drawer? I want to make sure this is the correct bed. Are the dimensions and type of wood correct? What color is it?" Hello tgard, this is solid Acacia wood that is wire brushed, stained and treated with a rustic glaze then sealed with protective lacquer, it does not include drawers, but is the bed pictured. Thanks for shopping with us! "What are the dimensions of the King?" Hello klfmorrison, this is approximately 51"H x 83"W x 88"D. Thanks for shopping with us! Hello losapaige, the California King is approximately 51Hx79Wx91D Have a great day!